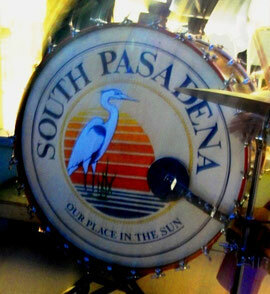 The Story of Our Bass Drum - Welcome to the South Pasadena Community Band Website! "Photographs of the Ringling Bros. and Barnum & Bailey (RBBB) band show a highly decorated bass drum with many tension rods. One wonders about the drum: its origin, design, and eventual status. The drum was designed by George Way, a representative of the Leedy Drum Company, who was a personal friend of Merle Evans. The drum is unusual, besides its fascinating decorations of circus silhouettes, in that it has 28 tension rods on each side (Photo Left). The drum was given to Merle Evans, conductor of the RBBB circus band. It was not the property of the circus. This drum, the last of a series of decorated bass and snare drums, was made by the Leedy Drum Company, and began its use in the 1942 circus season. Photo middle, shows the drum with Sherbundy and Red Floyd on the drum team. This was taken during a late 1940s date. Following this, the drum and chimes set, which remained the property of Merle Evans, were stored in Merle's garage at his home on Shade Avenue in Sarasota. In time, the drum was beginning to deteriorate due to the humid climate. He eventually sold the drum and chimes to the Selama Grotto band of St. Petersburg, Florida. Because of its size and weight, the Grotto band found it impractical to use the drum in parades. Seldom used, it was stored at the Masonic Home in St. Petersburg. The Grotto Band eventually donated the drum to the South Pasadena (Florida) Community Concert Band. Band member (the late) Richard Richardson undertook a project to restore the drum. He found it in very poor condition because of its disuse. One head was broken, the varnish on the shell was badly checked, the circus figures which had been appliquéd to the shell were missing, the paint on the hoops were faded and chipped, and the hardware was badly corroded. Richardson completely disassembled the drum. He sanded the shell to the bare wood and finished it with polyurethane. All the metal parts were reworked. The hoops were sanded and painted to the original red and white enamel. Photo on the right shows the restored drum."